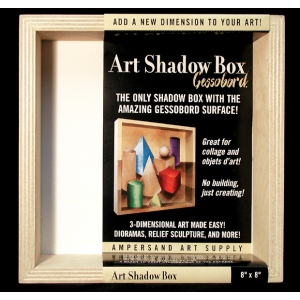 * This new Art Shadow Box has Gessobord on the Inside! * Available in three sizes, the new Art Shadow box from Ampersand is the first of its kind. * Inside, paint away on Ampersand's signature Gessobord surface. * Then, custom paint the interior sides to expand your painting into three dimensions! * Each box is 2" deep making them great for dioramas, installations, and three-dimensional painting. * All sides are paintable and made with Ampersand's premium quality wood materials. * Available in 6" x 6", 8" x 8", and 12"x 12"